When violence broke out in Syria in early 2011, many Syrians began to flee their country, looking for a safe place for their families. By the end of 2012, over 500,000 Syrians have found temporary residence throughout Jordan. About one third of these are in and around the Zatari refugee camp in northern Jordan. Then families were terrorized by violence in Iraq, causing them to flee, joining the Syrian refugees in Jordan. With only the clothes on their back and what little money or possessions they were able to carry, the refugees are in a desperate situation. Some of the families live in the Zatari refugee camp where they have access to medical care, water, electricity, and schooling for the children. However, some families have joined together to share the rent for flats or small houses nearby. Our GHNI team in Jordan tells us that up to 20 people might share a two bedroom house. Visit our Village Blog & Country Blog! What began in 2011 as Disaster Relief evolved over two years into a longer term commitment for GHNI as the conflict in Syria, and then Iraq and relationships developed between the Jordan GHNI team and the refugees. 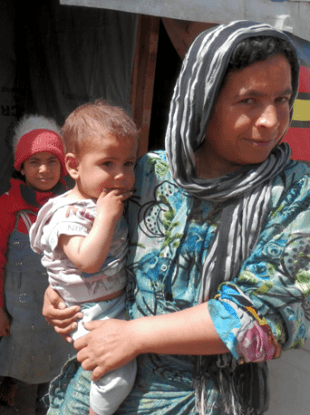 While the refugees remain in camps and other temporary living conditions, GHNI will continue to provide relief and offer hope through relationships with these families who have lost everything. The desire of GHNI is to continue helping these displaced and desperate people even after resolution in Syria and Iraq. By 2014, the team developed relationships with over 800 families who have expressed great interest in TCD. Having left jobs, houses, and family back in their home country, GHNI aims to help these families to get back on their feet, reform their community, sustainable living, and hope. As long as the violence persists in Syria and Iraq, there will be families living in an alien country wondering where they will find their next meal or how they will care for the needs of their children. You can help relieve some of their suffering by adopting one of these families as they work toward long-term sustainability. Our team in Jordan would like to introduce you to a specific family who needs your help. Will you consider adopting a refugee family?